Supported by National Natural Science Foundation of China (U1603283). Abstract: Objective To explore the effects of lupulone (LUP) and humulone (HUM) in Humulus lupulus L. on osteoblasts and osteoclasts of rats. Methods Osteoblasts and osteoclasts isolated from 24-h-old Wistar rats were studied and divided into control group, LUP-treated low (10-15 mol/L)-, medium (10-14 mol/L)- and high (10-13 mol/L)-dose groups, and HUM-treated low (10-15 mol/L)-, medium (10-14 mol/L)- and high (10-13 mol/L)-dose groups. After drug treatment, the proliferation, differentiation and bone mineralization of osteoblasts were determined by MTT assay, alkaline phosphatase (ALP) activity assay and alizarin red staining, respectively. Osteoclasts were counted and tartrate-resistant acid phosphatase (TRAP) activity was measured to evaluate the effects of LUP and HUM on the activity of osteoclasts. Osteocalcin (OCN) levels were measured by kit assay, and the expression levels of bone formation related proteins osteopontin (OPN), bone sialoprotein (BSP), bone morphogenetic protein 2 (BMP-2), bone resorption related proteins cathepsin K (CK) and matrix metalloproteinase 9 (MMP-9) were measured by Western blotting analysis to evaluate the effects of LUP and HUM on bone metabolism. Results At the osteoblast level, LUP at dosages of 10-15 and 10-14 mol/L could significantly promote the cell proliferation (P < 0.05). LUP at dosages of 10-14 and 10-13 mol/L could significantly improve ALP activity and bone mineralization (P < 0.05, P < 0.01). LUP at dosage of 10-13 mol/L could significantly induce the expression of OCN (P < 0.01). Furthermore, LUP at dosages of 10-14 and 10-13 mol/L could significantly increase the expression of BSP and BMP-2 (P < 0.05). HUM at dosages of 10-15-10-13 mol/L could also significantly promote the osteoblastic proliferation, ALP activity and bone mineralization (P < 0.01), and could significantly increase the expression of OCN and OPN (P < 0.05, P < 0.01). Additionally, HUM at dosages of 10-14 and 10-13 mol/L could significantly increase the expression of BSP and BMP-2 (P < 0.05). 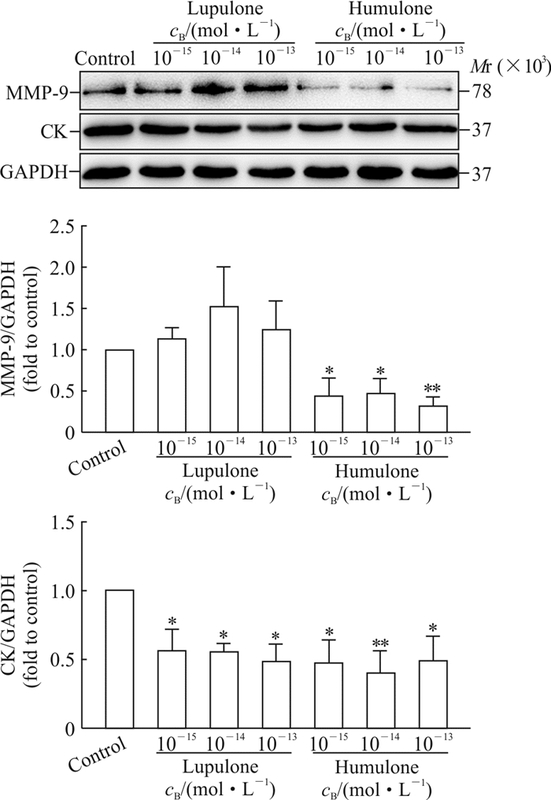 At the osteoclast level, both LUP and HUM at dosages of 10-15-10-13 mol/L could significantly reduce the number of osteoclasts (P < 0.01) and could significantly inhibit the expression of CK (P < 0.05, P < 0.01). HUM at dosages of 10-15-10-13 mol/L could also significantly inhibit the expression of MMP-9 (P < 0.05, P < 0.01). 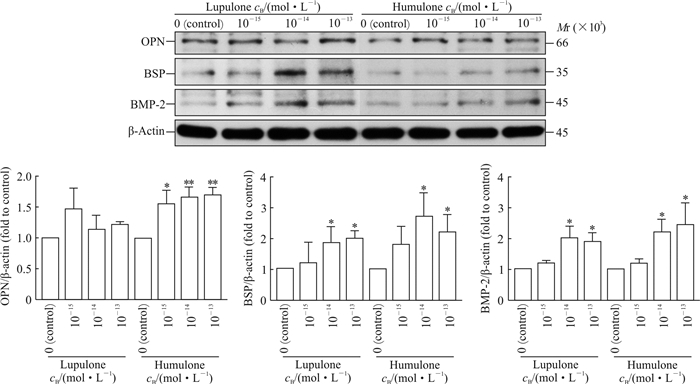 Conclusion This study preliminarily clarifies that LUP and HUM can prevent bone loss by promoting bone formation and inhibiting bone resorption, which provides a new reference for the development of osteoporosis drugs. 张乃丹, 蒋益萍, 薛黎明, 韩婷, 张巧艳, 辛海量. 仙茅酚苷类成分促进成骨细胞骨形成和抑制破骨细胞骨吸收[J]. 第二军医大学学报, 2016, 37: 562-568. ZHANG N D, JIANG Y P, XUE L M, HAN T, ZHANG Q Y, XIN H L. Phenolic glycosides in Curculigo orchioides promotes osteoblastic bone formation and inhibits osteoclastic bone resorption[J]. Acad J Sec Mil Med Univ, 2016, 37: 562-568. Consensus development conference: diagnosis, prophylaxis and treatment of osteoporosis[J]. Am J Med, 1993, 94: 646-650. 翟远坤, 牛银波, 潘亚磊, 李晨睿, 武祥龙, 梅其炳. 柚皮苷对体外培养乳鼠颅骨成骨细胞增殖和分化成熟的影响[J]. 中国中药杂志, 2013, 38: 105-111. 张葆鑫, 王兴国, 郝廷. 成骨细胞、破骨细胞与骨折愈合的相关性研究进展[J]. 中国现代医生, 2017, 55: 161-164. MANOLAGAS S C. Birth and death of bone cells:basic regulatory mechanisms and implications for the pathogenesis and treatment of osteoporosis[J]. Endocr Rev, 2000, 21: 115-137. ROOHANI-ESFAHANI S I, NO Y J, LU Z, NG P Y, CHEN Y, SHI J, et al. A bioceramic with enhanced osteogenic properties to regulate the function of osteoblastic and osteocalastic cells for bone tissue regeneration[J/OL]. Biomed Mater, 2016, 11: 35018. doi: 10.1088/1748-6041/11/3/035018. 安新玲, 韩金祥, 王世立. 骨形态发生蛋白的研究进展[J]. 食品与药品, 2009, 11: 69-73. COSTA A G, CUSANO N E, SILVA B C, CREMERS S, BILEZIKIAN J P. Cathepsin K: its skeletal actions and role as a therapeutic target in osteoporosis[J/OL]. Nat Rev Rheumatol, 2011, 7: 447. doi: 10.1038/nrrheum.2011.77.